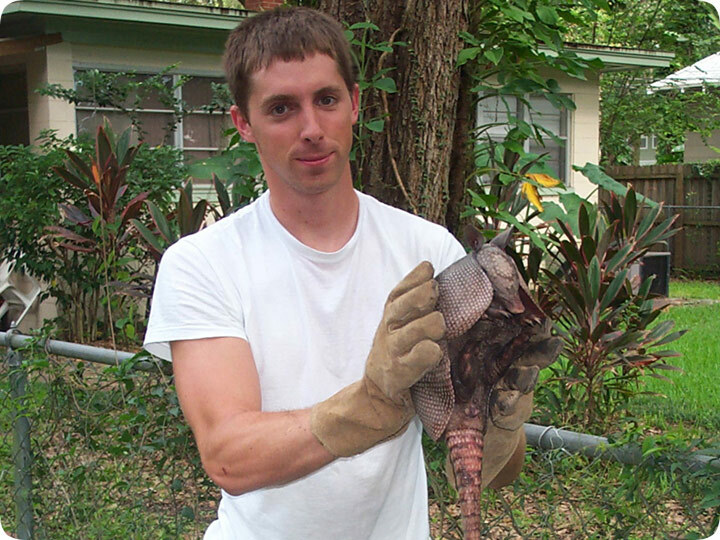 07.15.2003 - This is a photo of me and my armadillo pest control service based in Orlando FL. I caught this small armadillo from a customer's property. It's a juvenile, so I am able to handle it with these thick gloves. Notice how the armadillo has a worn down spot on its head. This is because armadillos don't hesitate to crash their way through brush, undergrowth, dirt, and even into hard objects. What armadillos lack in intelligence, they make up for in determination. What they lack in their belly, they fill with invertebrates such as earthworms and beetle larvae. This is often why they are deemed a nuisance by home owners. Armadillos can quickly destroy a lawn with their digging. They sniff about, using their keen sense of smell to detect food underground, beneath your perfectly manicured lawn. Then they dig it up, leaving a nice divot and pile of dirt. It's not a big hole, but if your yard has hundreds of worms or grubs, you could end up with hundreds of holes. Not only that, but armadillos have decided, over the past few million years, that it's a good idea to live underground. Thus they dig very big holes in which to set up camp. They often dig several of these burrows. They seem to prefer to dig them under or next to structure, such as under your porch or next to your house. Thus, they live near your yard, and dig it up real good. In addition, beware the removal of too much dirt from under any structure - it can weaken the foundation. Other than their digging, armadillos aren't really big pests. However, the digging is enough for people to seek out their local exterminator to provide armadillo pest control. Of course, a standard poison spraying extermination company won't take care of an armadillo problem. Only a dedicated and licensed wildlife trapper like myself is equipped with the tools and knowledge to solve an armadillo issue. So give me a call if you need to get rid of those pesky dillos, and I'll happily catch them and pose with them in a photo. Do it yourself: Visit my How To Get Rid of Armadillos page for tips and advice. Who Do I Call To Remove A Armadillo From My Lawn - Armadillos are amazingly frustrating animals that can really cause a massive problem for gardeners and householders, particularly if they gain access to the lawned area, where they can cause massive damage. The majority of people will call an animal removal specialist, and they will usually be able to either deal with the armadillo themselves, or to call an experienced armadillo trapper. Although the techniques that the majority of armadillo catchers will use to deal with the animal are fairly simple, the experience that these individuals can offer will be vital to dealing with the problem quickly. The amount of damage that can be caused to a lawn by an armadillo can be significant, because the armadillo will naturally look to dig in the lawn to find earthworms and other insects to eat. This will often leave a lawn that was once flat and green a pitted and pockmarked surface where there are small piles of soil across the lawn. For those who are looking for a suitable professional to deal with their armadillo problem, there are a number of different directories that people can use that can refer them to an expert armadillo removal technician. Where To Release Armadillo - One of the most important features for those people who are preparing to catch and remove an armadillo is to plan what they are going to do with the animal once it has been caught. This means planning out where they are going to release the armadillos, and it is best to choose a location that is well away from the property where the armadillo is actually being caught. Armadillos will not always be nomadic, and some may try and return to their old burrows, which is why the majority of experts look to release the animal at least five, if not ten miles away from the location where the armadillo was captured. The location where you choose to release the armadillo should also be considered, as it is very irresponsible to release the animal close to other people's properties, as it is possible the animal will just become someone else's problem. These are animals that will often cause trouble if they come into contact with people, so it is best to choose a rural location to release the animal. Armadillos prefer areas that are near woodland or swampy areas as these tend to offer the ground cover that these small animals enjoy.